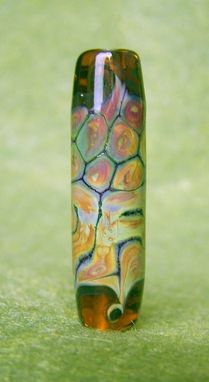 This little beauty was created on a base of transparent amber glass, with an organic pattern of dots and lines with raku stringer. Raku glass is fun to work with because you can get it to strike into a wide array of colors including blues, golds, greens, and violets. It measures 33 mm in length, and 9 mm wide. 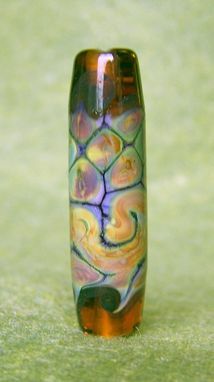 ♥I work with soft glass of many different brands and types. Generally I use a 1/16 sized mandrel unless otherwise noted. 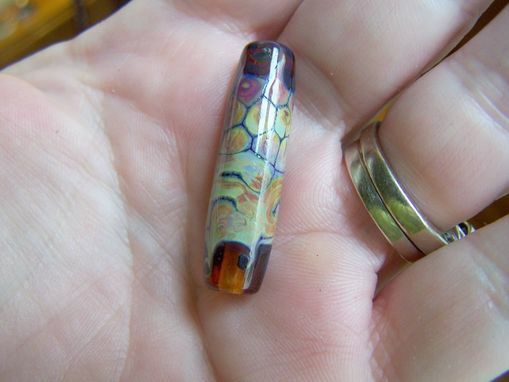 As a professional lampworker, all my beads are annealed in a digitally controlled kiln for strength and durability. I personally inspect each bead for flaws and I thoroughly clean the bead holes with my trusty Dremel tool. ♥All photographs are color balanced to represent the colors as accurately as possible; however different monitors do display colors differently. And the photographs are sometimes larger than life to show detail.